A curious note in The Art of Painting is the unnatural blue cast of the laurel wreath worn by the young model, Clio, the muse of history. A similar effect can also be seen in the foliage of The Little Street. 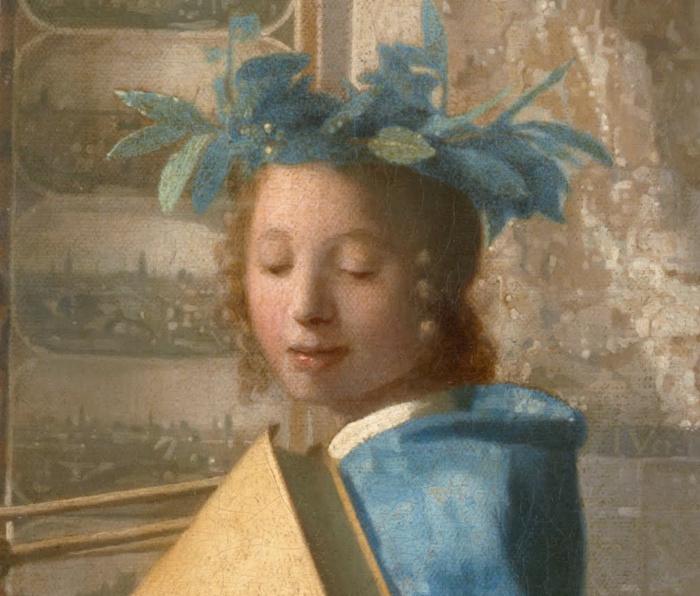 In both pictures, it is probable that Vermeer used a well-known technique called "glazing" to obtain a particular natural green which in time has altered. It is believed that the painter first modeled the leaves in various tones blue which were then allowed to thoroughly dry. Afterwards, he applied a thin layer of very transparent paint, in this case a yellow lake, called a glaze, over the blue leaves. The two colors, blue and yellow, are combined optically but not physically, creating a deep natural green unattainable by any single green pigments available to artists at the time. 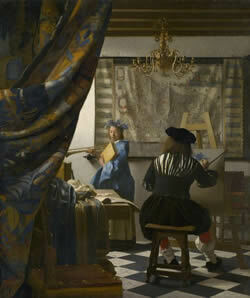 The superimposed yellow lake (a fugitive pigment, probably weld, in Dutch, wouw or woude, a natural dyestuff obtained from the cultivated plant Dyer's Rocket, a tall growing relative of the garden mignonette) has either faded with time exposing the blue of Vermeer's underpainting or been removed during early attempts to restore the painting. Glazing tends to produce a rich luminous effect analogous to the effect produced by stained glass. This jewel-like effect cannot be achieved by direct painting with opaque paint. Glazing was also employed to obtain a number of the so-called "strong colors" which were not otherwise available to the painter in the form of single pigments. For example, shades of purple had to be created by glazing the precious natural ultramarine blue over a reddish underpainting or red madder over a bluish underpainting (perhaps azurite). The final effect of a glaze is very difficult to anticipate and its use is probably overestimated by art historians who are prone to explain any particularly subtle passages with a glaze.